The Psychology Of Extreme Sports #Infographic ~ Visualistan '+g+"
Extreme sports athletes understand the line of separation between life and death and the tightrope walk they sometimes have to face in order to do what they love. There can be no feeling to replace flying free like a bird through the air, or successfully facing a mountain that rises to the heavens. These accomplishments make us feel stronger than being just mere humans, but these sports do have their own price to pay. Did you know that 1 out of 25 parachute jumps ends in fatality? 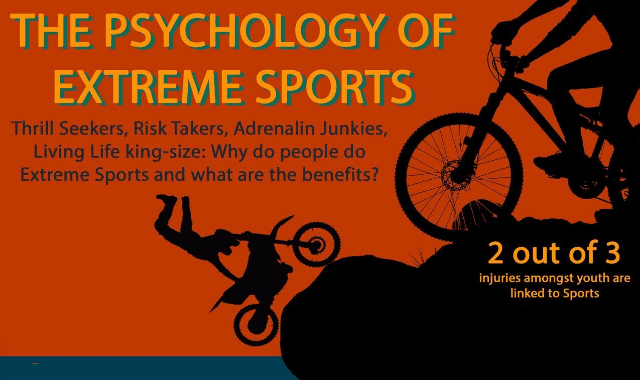 To learn more about the psychology of extreme sports, check out this infographic brought to you by Extreme Sports Land.